Mix cashew butter, water, salt and ginger (or curry powder) in a small bowl until well combined. 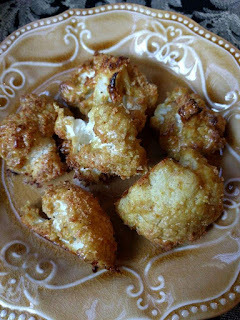 Place cauliflower in a large bowl and coat every piece with the cashew butter mixture well. Place coated cauliflower on parchment paper-lined large, metal cookie sheet (17x12) with sides. Sprinkle with bread crumbs (if using). Bake for about 30-40 minutes until cauliflower is just fork tender.